We were under the impression that the only reason mobile devices were invented was so that we could tweet and Facebook while on the toilet, but apparently some people think that’s kind of icky. 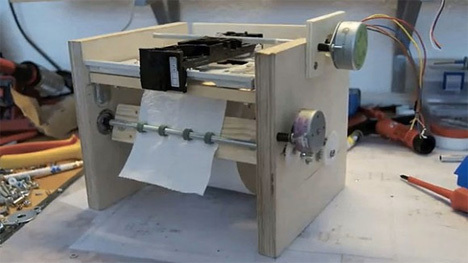 A German smartypants called Mario Lukas invented a surprisingly useful alternative that prints your Twitter or RSS feed right onto a roll of toilet paper. Take that, iPad. The printer is made of wood pieces, scavenged pieces of optical drives and CD drives, an Arduino controller and a pretty big dose of creativity. The printer is connected to the home or office network so it pulls your important updates and prints them out right in front of you. Then you get the satisfaction of using those important updates to, ahem, clean your caboose.